For hauling pretty much any bulk material out of the mine. Frequently used as trash trailers, but will haul bulk rock dust or gravel, or whatever you want to put in them. 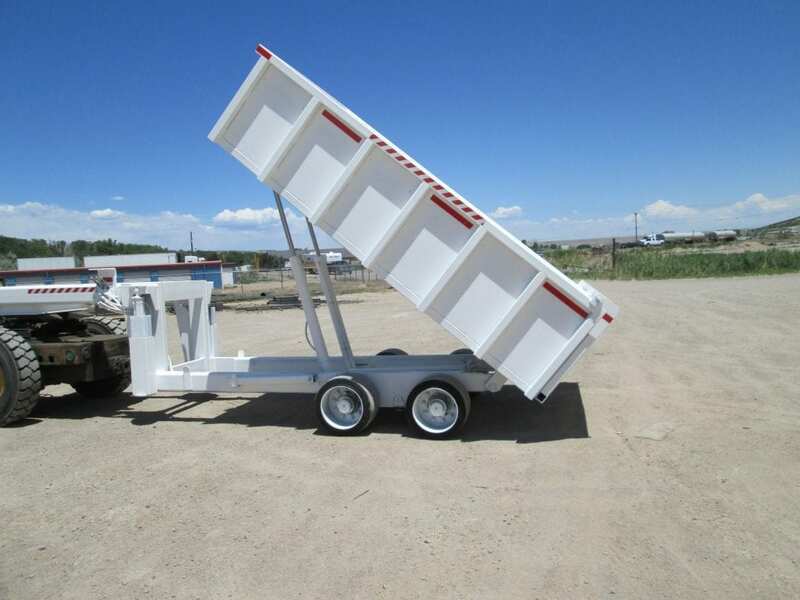 Uintah Machine manufactures heavy-duty dump bed trailers. The beds on these trailers are hydraulically tilted to dump the contents, such as trash or rock dust, out the back. The tailgate shown here pivots at the top and swings freely when the bed is raised. It can be closed and locked during transportation. Or we can put the hinges vertically on the side so that the tailgate(s) swing to the side. We will build your dump trailer with whichever hitch type you require, be it gooseneck, pintle, or other. The drawing here shows a single-axle model. But the photos show a dump bed trailer with two axles and Uintah Machine's walking beam suspension, which keeps all four wheels on the ground at all times for a relatively smooth ride and greater load carrying capacity. We also offer push-plate trailers, which are similar but use a hydraulic push plate instead of a dump bed. At Uintah Machine, we take pride in our work. You can count on receiving the lowest-maintenance heavy-duty dump trailer available for underground use. Our customers have always been pleased with Uintah's quality. We would be pleased to build a dump bed trailer for you. Email or call us at 435-738-2453 and tell us what you need.